as the market leader in the category. A top speed of 110 mph (177 kph) and a 3 kw on-board charger means the Brammo Empulse retains its crown as the world's fastest electric motorcycle in serial production both riding and charging. The 2014 Empulse embodies many new and improved components making it an EV technology tour de force. Fully 10 lbs of weight is removed from the Empulse, further improving performance, handling, and range. With the ground-breaking IET integrated 6-speed transmission, the Empulse is able to translate its 90 nm (66 lb-ft) of electric motor torque to over 880 nm (650 ft-lbs) at the rear wheel (in first gear). That's enough forward thrust to relegate direct-drive competitors to the rear view mirrors and compel the motorcycling press to compare the substantial performance to that of 650 cc twin class motorcycles. Of course performance isn't everything, and so the Empulse also boasts an impressive 438 MPGe (MPG electric equivalency) (.54 litre/100km-e) fuel economy, making the Empulse a smart move from a cost of ownership perspective as one of the cheapest motorcycles on the planet to refuel. "Our customers expect Brammo to design and produce the world's most desirable, high performance electric motorcycles and that's exactly what we do," said Craig Bramscher, Founder and CEO of Brammo. "Today's announcement underlines our commitment to listen to our customers and continually improve our products." Brian Wismann, Head of Product Development at Brammo, added, "The 2014 Empulse represents a huge effort by the engineering team at Brammo to further refine and reduce the platform's weight for the bike's sophomore model year." "We've also ensured that the bike is ready for its European launch with additional testing and certifications required for the EU market. All the hard work will be worth it when the first customer in Europe twists the throttle and gets their first 'EV grin'." 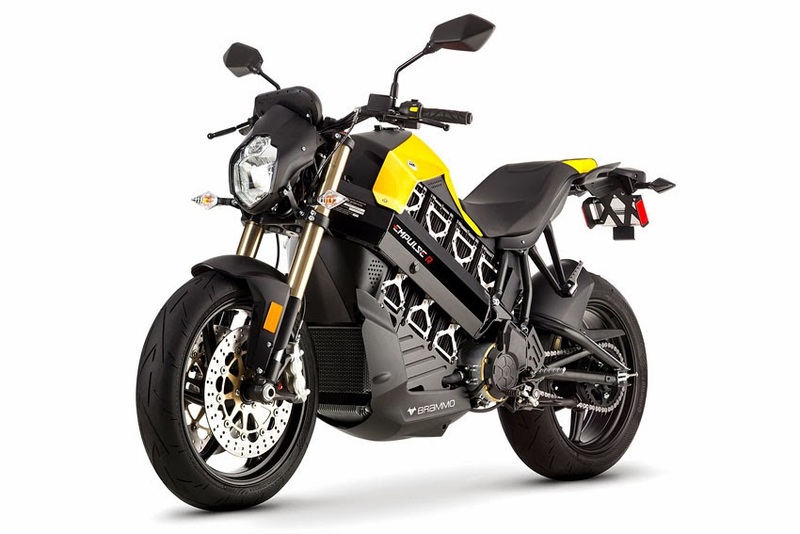 Still the only electric motorcycle to offer a 3 kw integrated onboard charger, the 2014 Empulse is compatible with nearly 7000 Level 2 public charging stations available in the US, with no extra equipment required. An Empulse owner can charge from 20 per cent to 80 per cent in less than 2 hours using this existing nationwide charging infrastructure. Overnight charges in your garage are no problem either, as the Empulse comes standard with a J1772 charge coupler that plugs into a standard household outlet. The distinctive Empulse battery brackets that secure the Brammo Power 15/90 battery packs are now redesigned and nickel plated, adding a distinctive and technical look to the bike's familiar profile. The 2014 Empulse sports a redesigned LCD dash in a robust waterproof housing, which displays a wide range of riding metrics including: battery SOC (State-of-Charge), road speed, motor speed, odometer, energy use, gear position, battery status, estimated range, and system status. The 2014 Empulse has changed to a tapered aluminum handlebar with oversized clamp diameter. These bars give a better overall riding position and are manufactured by Accossato in Italy specifically for the 2014 Brammo Empulse R.
2014 sees a move to new rubber manufactured by Continental. The SportAttack 2 is acknowledged as the best all-round performer. Continental engineers focused on creating a sport bike tire that can provide the best overall quality. The SportAttack 2 uses a Continuous Compound. This allows Continental to use one single compound throughout the tire but still have different wear and grip characteristics for the center and sides of the tire. During the molding process, the sides and center of the tire are heated at dissimilar temperatures to make the compound softer or harder. This treatment creates a seamless transition from the more flexible sides to the more wear resistant center. Two new colors are introduced to the color palette this year, standard for the Empulse R and optional for the Empulse. In addition to true blood red and eclipsed black, customers can now select Maillot Jaune Yellow and Neodymium Silver Metallic. The lower body panel now sports a white Brammo logo to make identification even easier for those not yet familiar with the world leader in electric motorcycles. During 2014 the award winning Empulse and Empulse R will become available in the United States, Canada, Europe (including the United Kingdom), and in Asia. Brammo's ever growing dealer network and service capability ensure that our high levels of customer service will be maintained as the company scales up its international operations.